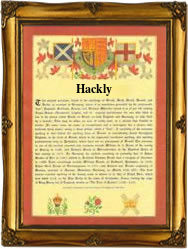 Recorded as Hackley, Hackly, Hakely, Hockley, Hockly and possibly others, this is an English locational surname. It originates either from one of the places called Hockley in the counties of Essex, Warwickshire, Cheshire and Staffordshire, or from some now 'lost' medieval village possibly called 'Haca-leah' or similar. This would have translated as the 'curved clearing in the forest', whilst Hockley derives from the Olde English pre 7th century 'hocga - leah' meaning the 'hog farm in the forest'. Locational surnames were usually 'from' names. That is to say names given to people as easy identification of a stranger, after they left their original homesteads to move somewhere else. Amongst the early recordings in the surviving church registers of Greater London are those of Andrye Hackley, who was christened at St Botolphs without Aldgate, on October 9th 1569, Anne Hockley, christened on May 15th 1575, at St. Giles' Cripplegate, the marriage of John Hockley to Elizabeth Tytton at St. James Clerkenwell, on April 21st 1606, and the recording of John Hakely at St Dunstans in the East, Stepney, on January 31st 1655. A coat of arms associated with the name has the blazon of a gold shield charged with a fesse between three red mascles gules. The first recorded spelling of the family name is believed to be that of William de Hokkele. This was dated 1273, in the Hundred Rolls of Huntingdonshire, during the reign of King Edward 1st of England, and known as "The Hammer of the Scots", 1272 - 1307. Throughout the centuries, surnames in every country have continued to "develop" often leading to astonishing variants of the original spelling.